What’s good for the goose – and the duck and the swan – is good for the frog. At least when it comes to wetlands management. That’s the lesson from a new study that found wetlands conservation projects designed to benefit waterfowl also provide a boost other critters. “The biggest take-home message for folks is that these wetlands that we’re managing for waterfowl come with this other suite of benefits for other species of birds and frogs,” said lead author Doug Tozer, a program scientist at Bird Studies Canada in Port Rowan, Ontario. Management of publicly and privately owned wetlands includes measures such as diking to regulate water levels and control of invasive species. Ducks Unlimited estimates that 60 percent of historic wetlands in the Great Lakes region have been lost for reasons that include poor water quality and invasive species. 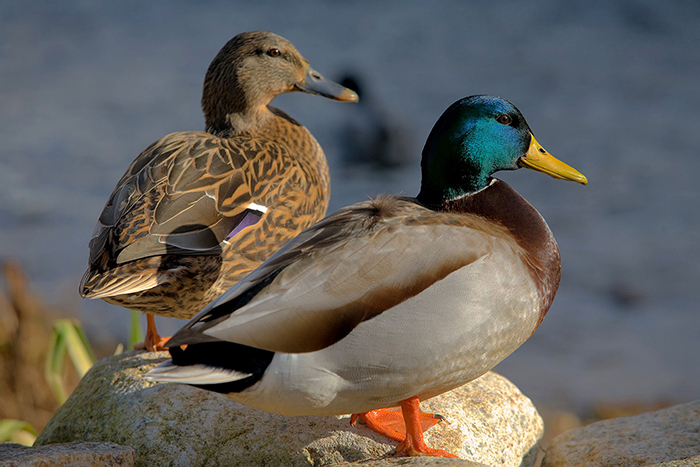 “In Michigan,” for example, “breeding mallard numbers have dropped 50 percent,” the organization says. “Wetlands are not important only for ducks but also for water quality,” said Chris Sebastian, the Ann Arbor-based public affairs coordinator for Ducks Unlimited’s Great Lakes/Atlantic region. The new study published in the “Journal of Environmental Management” compared 42 wetlands managed under the North American Waterfowl Management Plan with 52 similar unmanaged wetlands. Most are in southern Ontario and the rest are in Michigan. The observations and counts of bird and frog populations came from citizen-scientists working with the Great Lakes Marsh Monitoring Program. Compared to unmanaged areas, the number of non-waterfowl species, including at-risk and “priority conservation concern” species such as the black tern, common gallinule, least bittern, sora and Western chorus frog, “was higher in conservation project wetlands. However, not all non-waterfowl species appeared better off in managed wetlands. Occupancy estimates the actual proportion of sites where a species is present. There’s a distinction between occupancy and occurrence because a species can be present but unobserved during a survey because it didn’t call or show itself, observers missed it or it was temporarily away from the site during the survey, he said. Tozer said a future research project in New York will look at “a whole suite of responses in three wetlands treatments” – full, partial and no water drawdowns – to study the impacts on waterfowl, plants, marsh birds, seeds and tubers as waterfowl forage, and submerged vertebrates. Meanwhile, conservation groups are working on wetlands projects throughout the Great Lakes region. Last year, Ducks Unlimited and its partners completed projects on 1,164 acres in 17 counties, including Lenawee, Manistee, Mason and Newaygo. Among them were restoration of 24 acres of wetlands and 58 upland acres on nine private parcels in Lenawee County and restoration of 29 acres of wetlands and 34 upland acres on five parcels of private land in Mason County. Both projects received North American Wetlands Conservation Act grants. Major projects in 2016 included replacement of a pump that enables the Michigan Department of Natural Resources to control water levels at Manistee Marsh in the Manistee River State Game Area and the Maankiki Marsh restoration project that converted former farmland into wetlands in the Shiawassee National Wildlife Refuge near Saginaw Bay.